One surface layers consists consist of 3k-fabric style 452 in twill weave 2/2 (fabric prepreg CE 8201-200-45). Depending on sheet thickness the core layer consists of 3k-fabric and/or UD-non-crimp fabric 0°/90° (bidirectional). 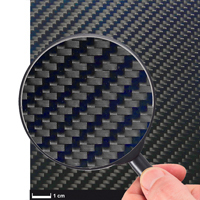 Carbon fibre sheets can be milled, sawn or cut by water jet. Please make sure to pre-drill the CFRP plates at the puncture site of the water jet.